For some reason this cue card really stumped me. At first I made a card using just stamps, ink and paper, leaving me with a finished product of paper, but I thought that was a really far reach. I went back into my supplies and started digging around in some of my stickers and embellishments. That's when I found the perfect solution for this cue card! Can you believe it? I didn't use one stamp on this card!!! How are you inspired by PAPER? Great take on the cue word! 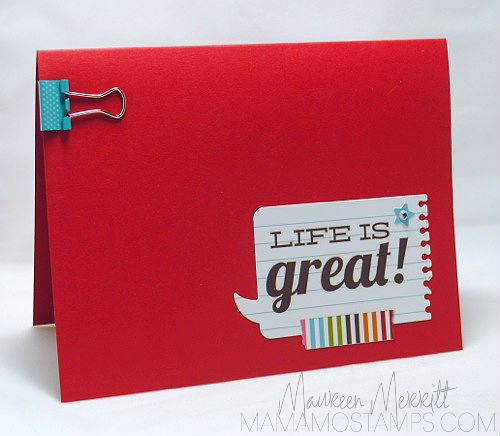 Love the bright red base and colorful clip! Such a colorful pop! Love the fun factor and the vibrant colors!! What a sweet little sticker! This card is so perfect for the cue card this week! Isn't it funny that paper was so tricky! I thought so too! I love your solution - great idea to showcase the embellishments! 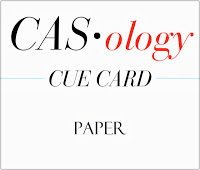 As always, your take on this week's cue card is genius! I love your notebook paper and that you added the clip...perfect! this is just so fun!! love the little binder clip! Loving that awesome notebook speech bubble! Love your no stamp card Maureen, just a bit of creativity is all it takes! Not one stamp...yet perfect again! Great color base and pop of white...love the clip, too!